Dynamics Telephony stores all its settings in CRM. Some are global and some are per user. You can change a user setting and make it global. This will mean that any new users will pick up that global setting as their default setting. You might use this to, for example, make all new users use a particular telephony connector, when they first run. This would eliminate a manual configuration step that the user might get wrong. In the following procedure, I will show you how to make a global setting that will default new users to use TAPI. The procedure is the same for other settings. Set up Dynamics Telephony for one user and set their telephony to TAPI and their TAPI version to 2.1. Change the “scope” value to “global”, per this snap. Dynamics Telephony supports a number of client rollout options to make the experience trouble free for all organization sizes. We will help with defining this rollout procedure during the on-boarding process. Ability to prevent update rollout until you have verified compatibility with your needs. Enables a completely silent install with no intervention from the user or IT. Specify the CRM URL for the user to use – normally this is entered by the user. With an MSI, this can be pre-configured. All other settings, such as the users telephony settings, can be pre-configured too per GLOBAL SETTINGS above. Customize aspects of the install such as application location, additional help files, shared phone-book location. Additional customizations such as registry entries to simplify telephony driver install. Dynamics Telephony uses a CRM User we call the Service User. 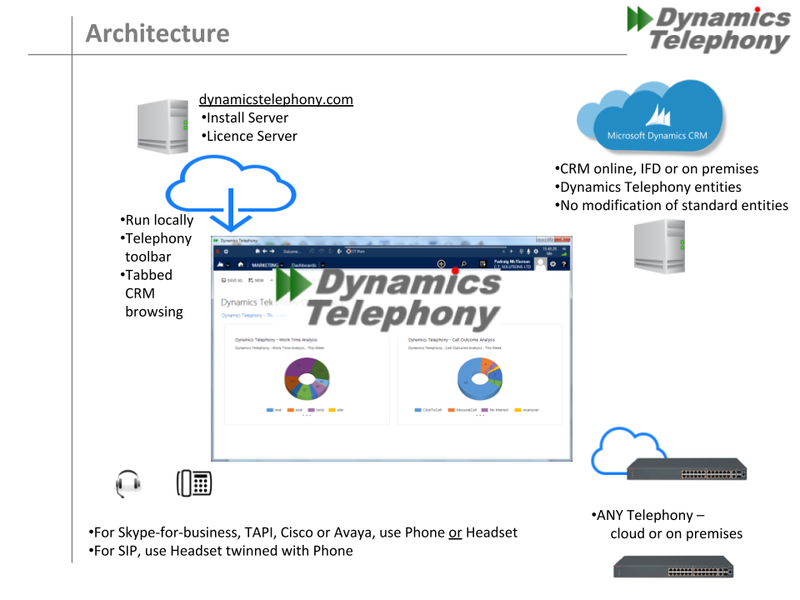 Dynamics Telephony uses the Service User in the background for various install and config tasks. The Service User has sysadmin role in CRM. You should restrict the permissions once the initial install is done. If you want to use 2-factor authentication for the Service User, then you will need an App password per this Microsoft article here. Alternatively, you should use a strong password for the Service User. If you need to change the Service User password, then it is best to change it in Dynamics Telephony at the same time as you do it in 365. 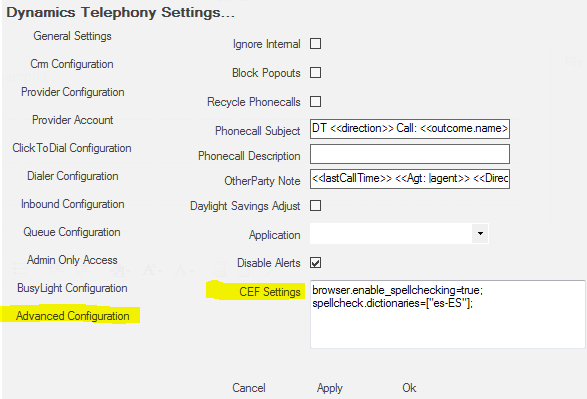 Have one Dynamics Telephony client open at… > Settings cog > Settings > CRM Configuration. Then make the change in both places and restart all Dynamics Telephony clients. If you change the password and get locked out of Dynamics Telephony, then follow the procedure below. 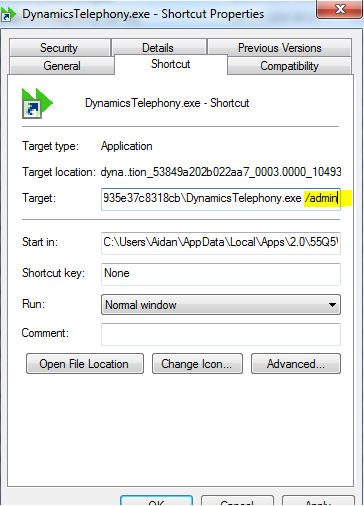 Now, when you run Dynamics Telephony using this shortcut, and the connection to CRM fails, you will a the dialog where you can change the service user and password. You already know, I hope, that it takes on average 5 calls to “make the sale”, whatever that means to you. So efficiently taking action after every call is mandatory. Taking action has to be very easy for users, or it will only be done selectively. In fact, taking action must take zero effort for your Inside Sales crew. Building trust has always been key to the sales process. You must have your customers trust you. Doing an action after every call, that includes communication with your prospect, will go a long way towards building that trust. And the opposite is true too. Not taking action after the call will contribute to a negative perception for your prospect, that they are likely to pass on to other prospects they might meet, rather than recommending your company as “worth a look”. However, do not take an action just for the sake of it. It is possible to take an action, like providing a full proposal or quote, too early in the sales process. Simply set up a callback at an agreed time & date – your prospect is not ready to talk right now. Agree to a follow-up call a few weeks before their “renewal date”. The best date depends on your market but “renewal” can be annual (in the case of financial services, for example) or 18 months (in the case of services contracts) or even monthly (in the case of SaaS). You should brainstorm the date for your market, but it is some time before the next buying point for the customer. Send full brochure based on requirements expressed during the call. You should have a few to choose from. And, set up a follow-up call for 2-3 days time. Set up appointment with Account Executive for specific date & time. Book a demo. Email the details to the prospect. Leave a voice-mail…and follow up with an email so they have another way to follow-up with you. And, set up a follow-up call for tomorrow. Phone call goes to busy or not answered – set up a follow-up call for later today and send an email so they have a choice on how to be contacted. 2-3 attempts should be made to contact the customer each day. Promote to an Opportunity in CRM for an Account Executive to pick up. Email the prospect with details. Disqualify. This can be the most important and difficult choice. Not disqualifying early enough will cost you a lot of wasted time. You can always set up a call for some time in the future, or add this prospect to a mailing list. You would usually have several different disqualification processes, depending on your judgement of a possible future fit for this prospect. Dynamics 365 for Sales can help.. It can seem like a lot of work to follow up on every call. However, Dynamics 365 for Sales has the flexibility and tools to make it an easy and repeatable process for users. The feature of Dynamics 365 for Sales that will help most with ensuring your Inside Sales team always take an action after every call is Workflows. Workflows automate a series of steps in CRM. The workflow can be triggered automatically or set off by a single selection in CRM. Send email based on a template with attached documents from any source including SharePoint. Set up a phonecall activity at a future date & time for a particular team or user to do. Move a lead to a campaign or queue for follow up by another team or individual. Adding Dynamics Telephony to your Inside Sales systems, means you can achieve a smooth, predictable, repeatable process for follow-up that ensure 100% follow-up. 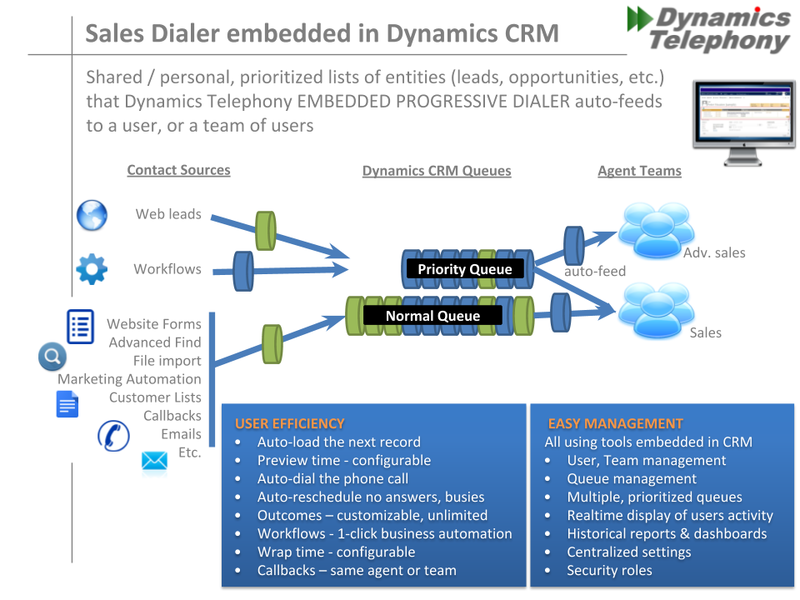 More than half the time, Dynamics Telephony can automate the follow-up action and the user has to take no action. The rest of the time, Dynamics Telephony provides a one-click follow-up for the agent, making it super-easy to use. Super-easy and totally integrated, one-click follow-up selection. Fully automatic follow-up for unanswered or busy phone calls. Automated voice-drop feature leaves a pre-recorded voicemail message – saving time and increasing repeatability. Pop follow-up calls to the user, or team, at the appointed date & time. Make sure they get done promptly. Auto-dialer saves time on every call ensuring users are happy to do follow-up calls. take action after every call. 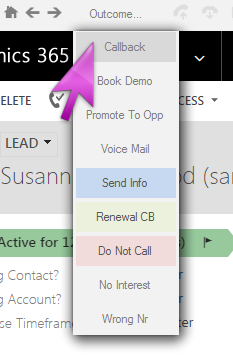 Dynamics Telephony is perfect if you use CRM Orders, where it can pop Orders (if there are any open for the caller) or pop the callers Contact record. Furthermore, the phonecall activities are logged against the Order as appropriate. Orders have two phone numbers (Bill To Phone Number and Ship To Phone Number) you can use to match against the incoming call. Or, you can add a custom phone number field for Dynamics Telephony to search. TIP: Set a condition that the Order must be open (status=active) for the phone number to be populated. In this way, only open Orders will match and pop. 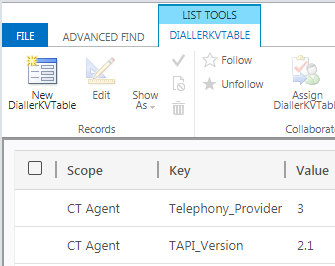 In the custom entity dialerKVtable, add an entry for each phone number field you want to search.. 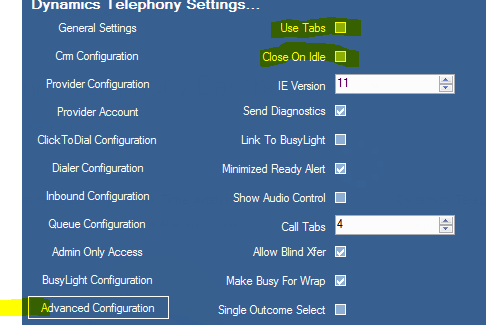 In Dynamics Telephony settings > Inbound set.. TIP: If you set above to “contact, salesorder” then Dynamics Telephony will pop the Contact if there are no open Orders. However, if there is one open Order you will get a multi-match to choose between the Order and the Contact. In the multi-match dialog, the Contact will show at the top of the list.